Duquesne's chapter of Student Society of Health-System Pharmacy (SSHP), a branch of the American Society of Health-System Pharmacists (ASHP), received an Outstanding Professional Development Project Award in December for their annual Spring Residency Experience Event. 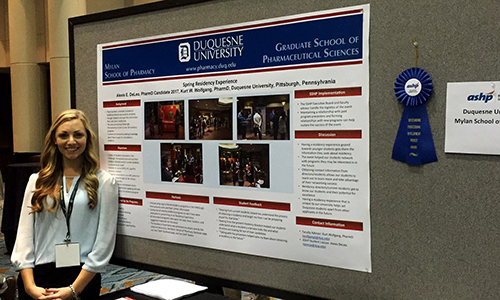 Alexis DeLeo, president of Duquesne's SSHP chapter, created a poster about the Spring Residency Experience highlights and presented it on Sunday, December 6, 2015 at the 50th Annual ASHP Midyear Clinical Meeting in New Orleans, Louisiana. Duquesne's SSHP chapter was one of only 24 schools selected to win this prestigious award, out of 123 student chapters. Projects were evaluated on four categories: Content & Information, Creativity & Resourcefulness, Service, Outreach & Impact, and Overall impression. DeLeo said that for the Spring Residency Experience, current pharmacy residents and residency directors from the Pittsburgh area are invited to come to the Duquesne campus to network with student pharmacists. She said that representatives of the residency programs can present research that they are conducting, or they can simply talk with students and answer their questions about the process of applying for and going through a postgraduate residency. "I believe that the Spring Residency Experience is beneficial for our students because it gives them a chance to network with current residents and residency directors without being in the high-stakes atmosphere of a formal residency interview. They get the chance to have their questions answered and further explore if a residency is the right choice for them," said DeLeo.